Light up your home and add proper ventilation with the VELUX VSC 3046 2004 30-1/2" x 46-1/2" solar powered skylight. The top hung window has a gray finish and is designated for curb mounting. The installation is very easy and requires no wiring for operation. This model needs a curb with the outside dimensions of 33-1/2" W x 49-1/2" H and roof pitches of up to 60°. An included solar panel provides an integrated highly-efficient battery with proper charging. A fully concealed operator uses the battery power to open and close the skylight. Besides, the solar panel even works with indirect light on cloudy and rainy days to assure stable operation. A built-in rain sensor automatically shuts the skylight when it starts raining. This model comes with a Neat® Lo-E3 tempered over laminated glass for better protection from heat gain and fading. 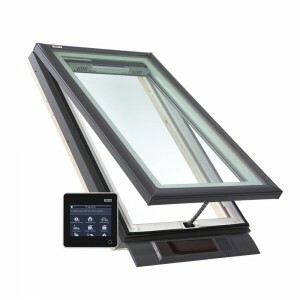 An included VELUX KLR 200 remote control complements your skylight operation and overall home automation. Also, the model is eligible for a 30% federal tax credit to make the unit more affordable. Improve light and air control in your home with the VELUX VSC 3046 2004 "Fresh Air" skylight.